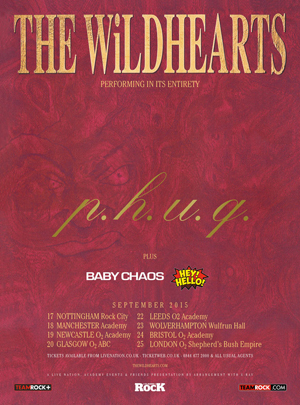 THE WILDHEARTS have announced a September tour in commemoration of the 20th anniversary of their most successful album, P.H.U.Q.. To celebrate the event, the band will playing this classic album in its entirety on the tour. Support will be from the recently reformed BABY CHAOS and Ginger’s brilliant side-project HEY!HELLO! P.H.U.Q. was released in May 1995 and crashed into the UK Top Ten Album Chart at number 6. The album spawned two Top 40 hit singles, “I Wanna Go Where The People Go” and “Just In Lust”, which reached numbers 16 and 28, respectively.